Why Should There Be A Moratorium On Vaccines? My new book, Eat to Beat Disease, Foods Medicinal Qualities was published July 20, 2016, and Blog Talk Radio show “In the Know” host Sallie O. Elkordy interviewed me about it, but before we got to talking about my new book, she asked a pointed question about vaccines since she knows that I have researched vaccine information since the 1980s and wrote Vaccination Voodoo, What YOU Don’t Know About Vaccines the only book I know of that addresses most of the toxic ingredients in vaccines and the damage they cause from published peer review journals, which is not being taken seriously by the medical profession. What would be the most logical, sensible and FACTUAL answer to that rather contradictory question regarding vaccines? The primary reason for a moratorium on the vaccination program is the fraud and downright deceit involved in what I call “tobacco science” exercised by the CDC and FDA in approving new vaccines for licensure going back to the 1950s with the polio vaccines, and now even more prevalent than ever, I think, with regard to the horrible state of children’s health with childhood Autism obviously from the MMR vaccines, plus other serious chronic diseases in childhood not experienced demographically before the current craze to vaccinate right out of the womb. Add to that the serious health effects, including deaths, from the HPV vaccines given to preteens and teenagers. Furthermore, there’s a video on the Internet wherein Dr Maurice Hilleman, MD, the father of modern vaccines who was the vaccinologist at Merck and Company, discusses in no uncertain candid terms the SV40 virus that was in vaccines, especially the polio vaccine, which the CDC finally admits was there and the US Congress held hearings on in 2003 wherein it finally was confirmed that 98 million or more U.S. kids were vaccinated with a cancer-containing virus vaccine to prevent polio! However, is that the reason for the cancer epidemic today? Fraud and deceit at the CDC and FDA can be verified in the June 2000 Simpsonwood Meeting held in Georgia wherein the FDA held a clandestine meeting to discuss the findings of the CDC’s epidemiologist Dr Thomas Verstraeten, MD, that autism was implicated in vaccines! The end result of that meeting was to send Verstraeten back to the drawing boards to rework his research so that no autism links could be found, which he did and which the FDA/CDC keep stating all these years as factual, whereas in reality it’s a boldface scientific fraud. That autism-related fraud was exposed further by William Thompson, PhD, and is documented in the movie VAXXED, which can be accessed on the Internet. Thompson is on record in the movie telling how the FDA scientists gathered to destroy their research data that implicated autism in young black boys less than three years of age. They actually put that research into a trash can, but Thompson saved his research files and data and turned them over to U.S. Congressman Posey of Florida, who’s asked for a congressional hearing into the fraud and deceit in MMR vaccines but no such investigation has been held to date. Why? Then there’s the research by criminally-indicted Danish researcher Poul Thorsen, MD, PhD, whose work the CDC uses to prove there are no links between autism and vaccines. Thorsen is a wanted man for embezzling $2 million from the U.S. CDC and no one is going after him. Why isn’t criminal Thorsen’s work retracted, when they witch-hunted Dr. Andrew Wakefield for publishing that more research was needed on the MMR vaccine and gut problems since the vaccine virus was found in those kids’ intestines gastroenterologist Wakefield and associates observed? Is Thorsen as immune to prosecution as Hillary Clinton is regarding her personal emails, which apparently amount to a form of treason against the U.S. government for whom she worked as Secretary of State? Those are the reasons why there should be a moratorium on vaccines. There are many more instances I can recite, but I think you can get the idea that vaccines are a sham and an experiment in an unproven science that is harming a least two generations of children, the future of the human race. That’s got to stop, and that’s why there has to be a moratorium on vaccines. Sallie O. Elkordy is one of the most avid vaccine-free advocates and activists I know. I cannot compliment her work enough and, therefore, would like to support her efforts to establish a National Moratorium on Vaccination in the USA. According to Sallie, to date, there are activists in twenty U.S. states participating to bring vaccination to a halt. The project was initiated when Sallie delivered an address to the National Vaccine Advisory Committee (NVAC) at the Department of Health and Human Services on June 7, 2016. The transcript for that address was written by Viera Scheibner, PhD in Natural Sciences. Oral presentation is here. Beginning in August, ONE PERSON in each State STARTS by Grabbing & Downloading this banner to a printing website or to a printer. The banner has been sized to fit vistaprint.com’s smallest horizontal indoor banner (3′ x 1.7′), but any printer will do. Artwork was created for this purpose by Airmail-Greetings.com. The Kick-off occurred on August 1st with a Public Stand in New York City at City Hall. Many interviews regarding WHY people think that a Moratorium on Vaccination is needed have been conducted, starting with Dr. Rebecca Carley, MD, and most recently with Author and Journalist Catherine J. Frompovich. A Calendar has been created showing people participating in this effort (holding up their banners) and videos have been generated in support as well. As the Olympic Torch is passed from person to person until its destination is reached, so will our Moratorium banner be passed, but within each State from one vaccine injured family to the next until the end of October, Vaccine Injury Awareness Month. In November, one (or more) representative(s) from each State will convene in Washington, DC. The journey throughout this campaign must be photographed and/or videotaped and posted to social networking sites over the next 3 months. Hopefully, the Moratorium campaign to stop vaccination harms also will become a presidential campaign issue; that’s one of its goals. 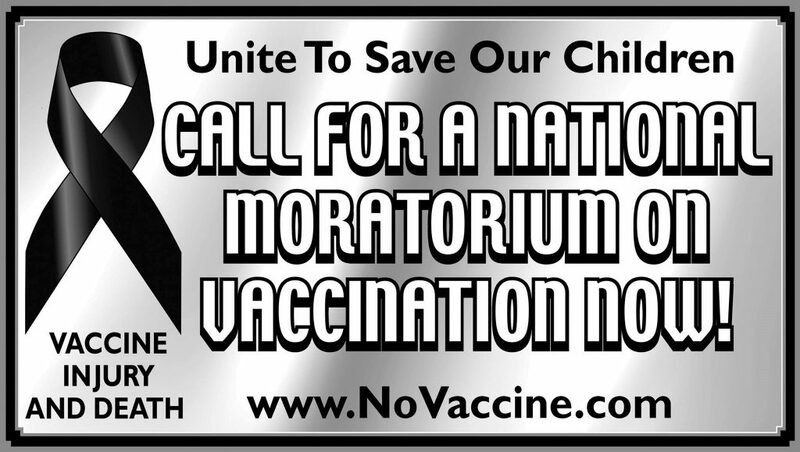 If you have a vaccine-injured family member and want to take part in a State-by-State effort to solidify a “National Moratorium on Vaccination,” please contact Sallie O. Elkordy at VaccineFreeNYC. Source: Why Should There Be a Moratorium on Vaccines?